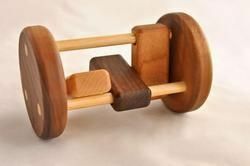 This wooden clacker rattle is a high-quality developmental toy, that would be the hit of any baby shower or birthday party! It makes a fun clacking sound when shaken or rolled on the ground, which entertains babies and toddlers of all ages and helps develop important motor skills. This clacker has cherry end pieces, birch dowels, and the inside pieces are walnut, cherry, and maple. It measures 6″ by 3 1/2″. Each piece of hardwood is hand-crafted, sanded to smoothness, and finished with a natural, beeswax finish. Colors of wood may differ from picture. Reader Showcase // Steppe Dresser for our New Baby!